The International Taekwondo Federation (ITF) is the organization which governs the art of Taekwon-Do. This organization is run by the founder of Taekwon-Do, General Choi Hong Hi. The ITF is represented by two organizations in the United States: The KoreAmerica Taekwon-Do Union (KATU) and the United States Taekwon-Do Federation (USTF) . These two organizations share responsibility for representing the United States in the ITF World Championships. In the very late 80's and early 90's, the two organizations fielded adult teams in alternate years. Since 1993, the USTF has fielded the adult team and KATU has fielded the junior (up to 18 years) team. 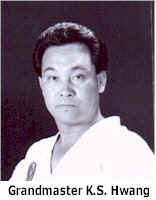 KATU, which is headed by Grand Master Hwang, selects and trains the members of the US Junior Team. The 1998 JR Team competed in India in this past October. KATU is currently holding tryouts for the next team. and much more.....contact Grand Master Hwang for more information..
KATU annual membership fee $24.00 for individuals and $30.00 for school memberships.........send in your application today ! !